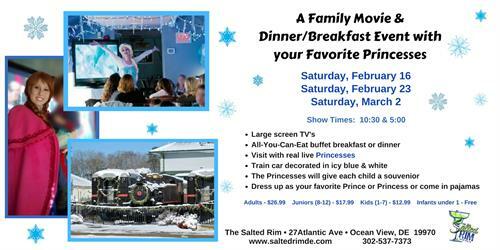 Dress up as your favorite Prince or Princess or just come in your pajamas as you enter a magical world as they attempt to un-freeze their Kingdom from eternal winter! decorated in icy blue and white while you enjoy an all-you-can-eat buffet breakfast or dinner. You will see the Princesses as you sing-a-long to your favorite songs! Each child will receive a souvernir as a reminder of their day.